Maple Leaves Watercolor Sketch – Let's Paint Nature! This morning I got a surprise from one of my co-workers and very close friend. She snagged a maple branch from her neighbors “perfect looking” maple tree just to give to me. Is that love or what?!? This morning at 8am it was such a brilliant shade of warm yellow. By 10am it was dull yellow and by noon the leaves were starting to curl. Don’t worry little yellow maple branch, work does that to me too, dries me out and makes me dull…..HAAA, HAA, hA! I had to take matters in my own hands. 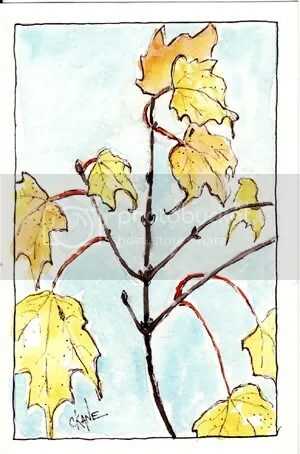 As soon as I noticed the beauty of the leaves starting to fade, I grabbed my super-duper travel sketch watercolor set and began to document a moment in this maple branch’s time. As of today, in the month of November, most all the leaves are gone from the deciduous trees around town. Just a tiny few however are still holding on…this golden maple for example has been celebrated on a day like today. The maples have been really pretty this year! I love the maple trees. Now, the leaves are all gone except the red oaks. Why those leaves hang on for awhile is a mystery to me. Also–I made a presentation on blogging to the local Bird Club. I showed your blog for tips on sketching and artwork from nature. The audience was very impressed with that painting you did of my photo sometime ago. bigworldcentral: Thank you very much! Lana: LOL! Paint it! Paint it! Dave: Yes, I agree very brilliant. I wonder if rainfall has anything to do with that? Joan: Good question, there must be a scientific reason for red oaks to keep their leaves!